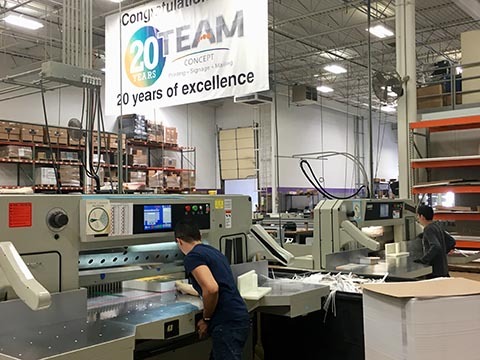 West Caldwell, N.J. – Earlier this month, the employees of Team Concept Printing in Carol Stream, IL (www.teamconceptprinting.com) had good reason to celebrate. Located 30 miles west of Chicago, the shop’s owners marked its 20th anniversary by hosting a company party at the nearby Arcada Theater’s speakeasy. The last year has been particularly rewarding for TCP, hiring more employees and adding equipment to keep up with an increase in business. One of those key equipment buys was a rebuilt, 45-inch SABER® paper cutter with an automated Microcut® Plus electronics system from Colter & Peterson. It increased the finishing department’s arsenal to five trimming machines, which includes another 45-inch SABER that Team Concept bought new in 2015. Vince Manini, vice president of the award-winning commercial printer, said the paper cutters, along with his employees, are getting a workout while staying ahead of demand. Manini credits the Microcut Plus system for helping improve the shop’s back-end productivity. As the crew at TCP has learned, Microcut Plus has several advantages. It saves time in pre-press by converting JDF files for set up. The 12-inch wide touch screen is easy to read and program. By memorizing cutting sequences, an enormous amount of time is saved from start to finish. Manini said TCP uses a Komori Lithrone HUV-29 press to deliver work to the paper cutters, which run for two, eight-hour shifts five times a week and often on the weekends. They utilize the six-inch lift gate on each SABER cutter and typically cut five inches of material, including the short runs. Manini indicated an uptick in thermography may spell bigger things ahead for TCP.